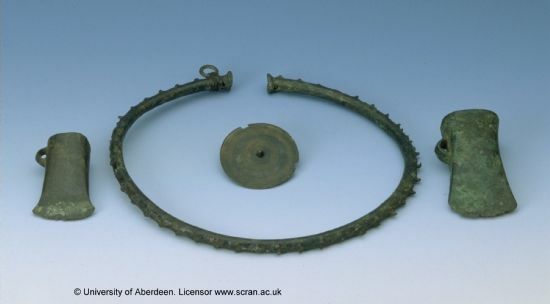 This late Bronze Age metalwork hoard was probably found near Dingwall in the 19th century. It consists of two socketed axeheads, the head of a sunflower pin and a neckring. The hoard is interesting for several reasons. It is one of a number of hoards and metal objects dating to the late Bronze Age (c. 950-c.700) from this area. Other examples include the spectacular Heights of Brae find with its gold jewellery (the largest surviving late Bronze Age gold find from Scotland) and a hoard of axeheads and spearheads from Highfield near Muir of Ord. A number of late Bronze Age axeheads have been found from the area, as well as a mould for making decorated examples from Rosskeen near Alness. The sunflower pin is a type of personal ornament found elsewhere in the Highlands and Scotland. This example has an upturned rim and is decorated with two sets of incised circles. The neckring is unusual in Scotland, with only two other similar neckrings previously known. Taken together they indicate an area with important people able to obtain high status metalwork. The hoard has travelled widely since its discovery. In 1851, probably shortly after its discovery, it was taken to South Africa when its owner William Joyner emigrated. In the 1980s his great-granddaughter donated the hoard, which now included some bits of African metalwork (not illustrated here) to the Marischal Museum, University of Aberdeen.